Our upcoming Giving Gala & Silent Auction will be a festive evening packed with new friends, delicious food, and the spirit of giving. But this special event would not be possible without the generosity and support of an amazing group of sponsors! The following question-and-answer blog series shines a light on our 2018 Platinum Level Sponsors. These incredible organizations and agencies that have gone above and beyond to support AIGA Charlotte, this year’s event, and our mission to advance our creative arts community. We hope you’ll take a moment to get to know the amazing companies behind the generous contributions and join us in thanking them for their support. We truly could not have done it without them. Tell us about CapTech. Where and when did it start? CapTech is a consulting firm, with a focus on technology and digital brand experiences. We got our start in Richmond, VA in 1997. Over the past 20+ years, we’ve really grown, with offices in seven cities, including D.C, Philadelphia, Atlanta, Columbus, Chicago, Denver and Charlotte! We’re almost 1000 employees strong nationwide, with nearly 200 people in our Charlotte office. 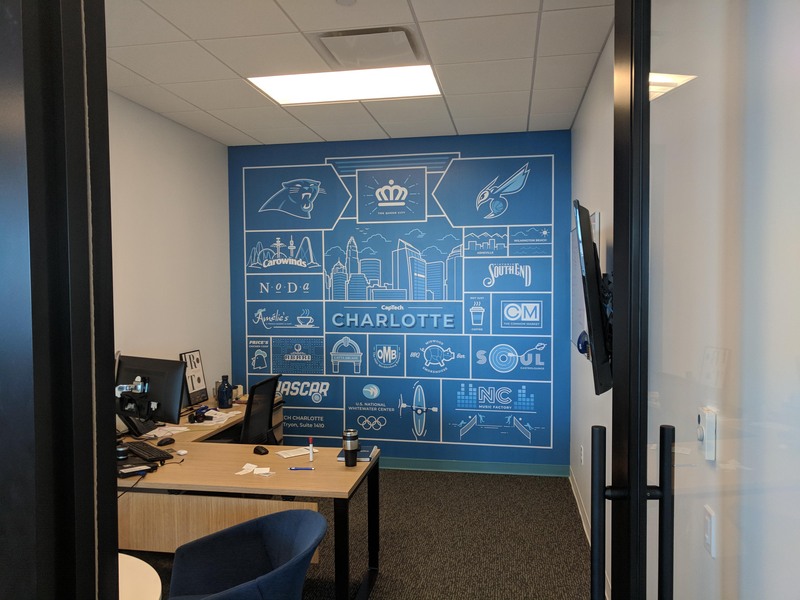 Within our Customer Experience (CX) practice in Charlotte, around 30 people work as visual and UX designers, UX researchers, writers, developers, and project managers. Our work focuses on creating great experiences for our clients—from websites, dashboards and apps to interactive games and AR/VR experiences. What types of services does CapTech offer? CapTech provides several service offerings, with a focus in four main areas: Technology Solutions, Customer Experience, Data & Analytics, and Transformation. • Insights: Research, usability assessments, personas, stakeholder interviews, etc. • Design: Copywriting, UX and visual design, development, etc. • Optimization: Analytics, SEO, content strategy, etc. • Technology: Tableau, AR, VR, IoT, touch screens, etc. What new and exciting things are happening at CapTech? We recently launched one of our quarterly innovation challenges, which is an ongoing internal initiative that encourages teams to come together to create innovative concepts that put emerging technology to work in useful and unexpected ways. The Internet of Things (IoT) is the current theme. This past spring the challenge was Augmented Reality (AR), with fourteen teams competing across all CapTech offices, creating AR concepts to accomplish a variety of things: improve the wayfinding experience in hospitals, visualize the proper form when lifting weights, or even see what could be made from a pile of Legos. These challenges give people the chance to design and build things they might not work on do day-to-day, while leveraging cutting edge technologies and tools. What makes CapTech unique to Charlotte? Some creatives might not be familiar with what it’s like to work in a consulting firm. We’re much like an agency operating inside a consultancy. Most of our team members work onsite at our office, but sometimes we work at the client’s office with internal teams, partnering with them on projects. We try to give our CX consultants opportunities through various client accounts to create variety in their work experience while they build new skills and discover what engages them most. • We have a brand-new space in Uptown, at 300 S. Tryon Street. 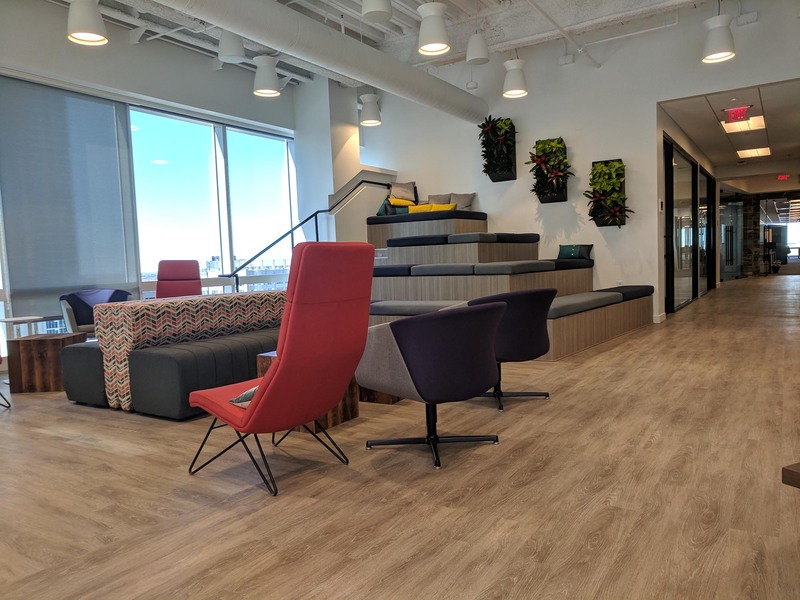 In addition to an open office that seats about 100 team members, we have a giant cafe with stadium couches, beer taps and wine fridge on the 14th floor with 180-degree panoramic views of Charlotte. We also tricked-out a usability lab for user and prototype testing available internally and for clients. • We focus on coaching at CapTech—employee growth and development is always a top priority. Every member of our team is assigned a dedicated coach to help the coachee reach professional and career goals as well as to offer guidance through the promotion process. • Our CX team is known for its sweet tooth! When a team member goes out of town, it’s strongly suggested they bring back candy from their travels. Recently, we had almond candy from Japan, toffee from Scotland, and honeycomb from Charleston! What does a day in the life at CapTech look like? Morning: Arrive at the office, make some coffee, read some design blogs, and settle in. Attend the stand-up (a daily meeting adapted from Agile) with your project team and hear what everyone has on their agendas and how you may or may not interact with them during the day. Mid-Day: You might design a digital experience in Sketch, work on some icons in Illustrator, prep for a client presentation, or get user feedback on a prototype. We review early and often with short loops, so we regularly schedule time with the creative director, development teams and our clients. We also have a wide variety of training and classes on-site for those who want to expand their breadth of knowledge, work toward certifications, or are looking for a particular topic for current or future application. Afternoon: As the day winds down, there might be a meeting to discuss an internal initiative or project. We recently had a team meeting in the afternoons, preparing for the GUTS pumpkin carving competition for Make-a-Wish. At the end of the day, you might grab a beer on tap and spend some time chatting with colleagues in the cafe about your day. We welcome friends, colleagues and clients who may want to come by, so if you ever want an office tour, let us know! CapTech makes a concentrated effort to get involved in the local community. In Charlotte, our involvement includes AIGA, UX meetups, Dribbble meetings, local conferences like FusionConf, and other creative and technology events. A few of our team members serve on the AIGA Charlotte board. 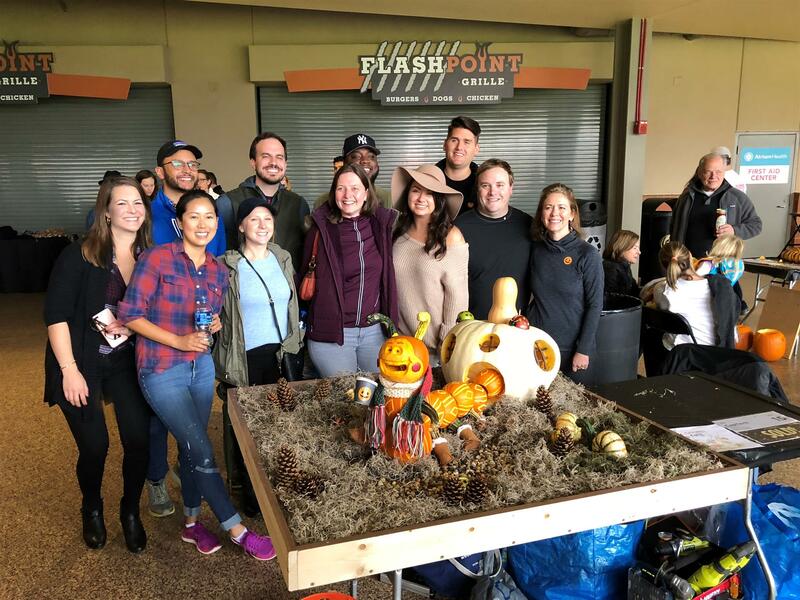 We encourage all our employees to get involved in the community — professionally and with non-profits — to learn, grow and find ways to give back that align with personal passions, interests, and lifestyle.